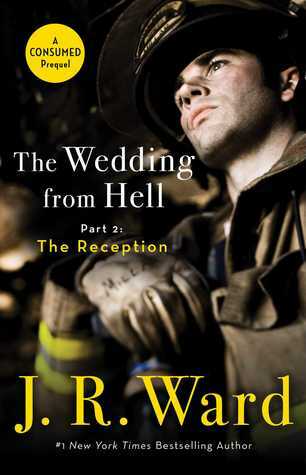 Today we get the second part in J.R. Ward’s free prequel, Wedding From Hell. These are so much fun. I love getting surprises like these from my authors. Here’s an excerpt to get you even more excited. And lips-to-lips had been better than good, the rare circumstance when reality had improved on a fantasy. After two years of attraction and sizzle and unacknowledged heat, that which had been pushed under the rug was exposed now. hit the exit and left Danny without a ride home. He’d called two hours later. He’d been in a bar, probably Timeout where the crew always went, the noise in the background loud and raucous. He was very tall, over six feet five, and he was built hard and muscular, his shoulders so wide, his chest so broad, his waist the point of the inverted triangle of his torso. His jet-black hair was still damp, and what sunlight there was in the mostly cloudy sky flashed blue in its depths. He was freshly shaven—his cologne reaching her nose even before he stopped in front of her—and his eyes were that brilliant blue that had always arrested her. It takes a certain kind of man to stand out among the Bachelor Firemen of San Gabriel. Firefighter Derek “Vader” Brown is one of a kind—six feet of solid muscle with the heart of a born hero. It’s that protective streak that has him pursuing a promotion to Captain to pay for his mother’s home care. And it’s why he intends to figure out why his sometime girlfriend Cherie Harper runs hot as hellfire one minute and pushes him away the next. Cherie’s got it bad. Vader sweeps her off her feet—literally—and their chemistry is combustible. There’s just the little problem of a nightmare from her past she was desperate to escape. And then her sister Trixie arrives, causing havoc for Cherie and the male population of San Gabriel. Cherie doesn’t want her past to complicate Vader’s life or his career. But there’s nothing like a firefighter to break through all your defenses, one smoldering kiss at a time . . .
Have I told you how much I love firemen?? No? Well, I am obsessed with them. 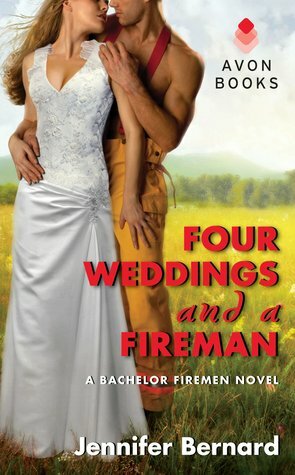 I think it’s the firewife in me that’s partly to blame, but I can’t get enough firemen books. So when I was given the chance to read Jennifer Bernard’s newest book, I just HAD to jump on it. I’ve read all of her Bachelor books, except for two. They’re some of the ones that staring at me, every time I turn on my Kindle. *sigh* Soon. This book is about Derek “Vader” Brown. He’s the joker of the San Gabriel Fire department. And I was quite excited to read his story. He’s been dating Cherie, off and on, for over a year now. When he asks her to marry him, she turns him down, TWICE!! That’s right, he asks her on two separate occasions and both times he’s been denied. But he loves her and hopes that she’ll change her mind soon, before he loses his mind. Cherie has loved Vader, since about two months into their crazy relationship, but she never told him. There are things in her past that she’s afraid of and doesn’t want him to be dragged into it. So when she thinks Vader is getting too close, she puts the rails on. But she knows she can’t keep doing this forever. She hates keeping secrets, but she knows he’s keeping some too. So she decides to let him go. But soon, Cherie’s past catches up with her and Vader is dragged back into her life. Will their secrets finally get spilled? Will the curse of the San Gabriel Fire department strike again?? I do believe it will.